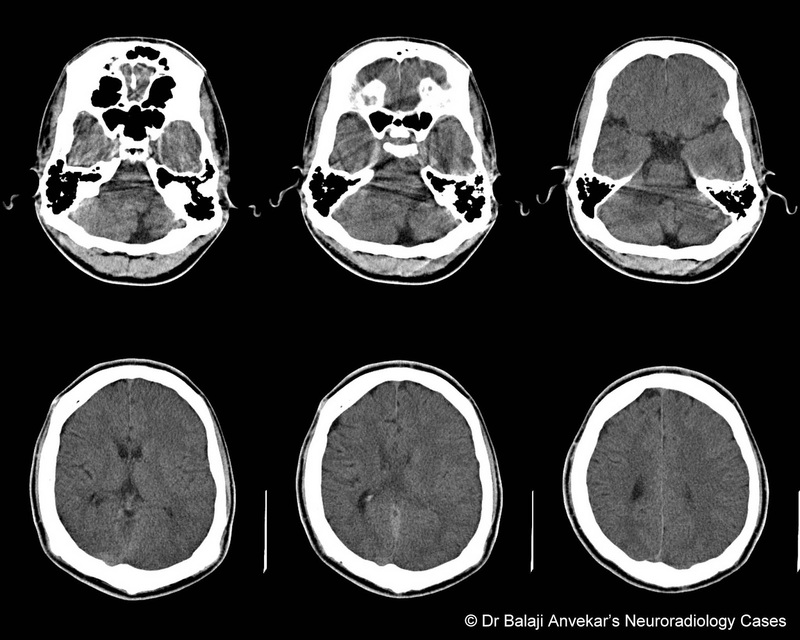 A rare midbrain stroke syndrome that involves the tectum of the midbrain, including the quadrigeminal plate. Classically, the syndrome involves the oculomotor nerve fascicles and superior cerebellar peduncle, leading to ipsilateral CN III palsy and limb ataxia respectively. Although it can be caused by stroke, especially hemorrhages rather than infarctions, it is more commonly seen due to neoplasm. Nasolabial cyst also known as nasoalveolar cyst or Klestadt Cyst. A rare non odontogenic, developmental cyst derived from epithelial cells retained in mesenchyme after fusion of medial and lateral nasal processes and the maxillary prominence during fetal development, occurring in midline at superior alveolar margin in alar region of nose. 3 times more common in females than males, most often an asymptomatic, mobile fluctuant non-tender swelling. 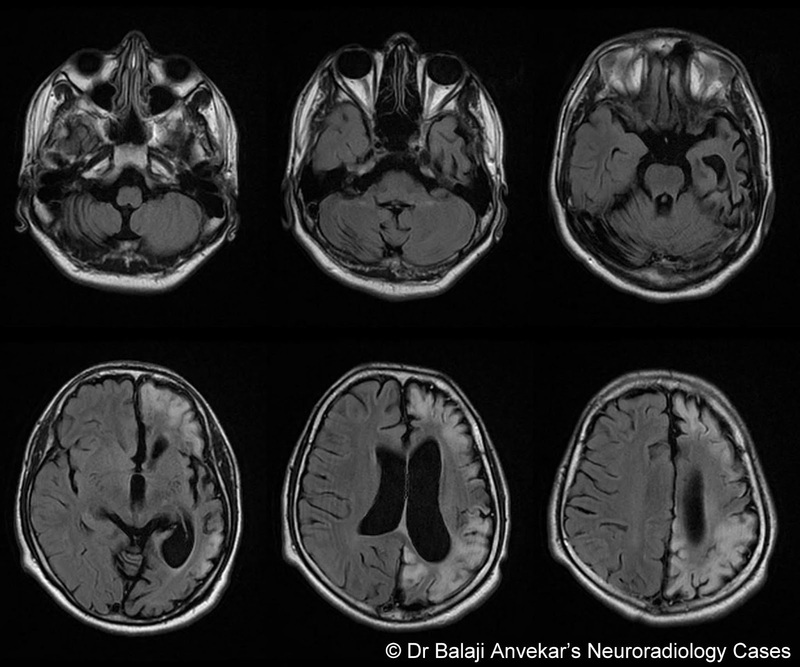 Often detected incidentally on CT or MRI BRAIN as isodense round nodule on CT. Signal characteristic of lesion varies on MRI ranges from hypo-to hyperintense on T1-weighted images and Hyperintense to hypointense on T2-weighted images depending upon its content, clear or thick. Differential diagnosis is odontogenic cyst which is peri apical inflammatory lesion associated with osseous thinning of adjacent superior articular margin. Clinically: Floppy infant / hypotonia. Diffuse cerebral cortical atrophy marked in bilateral frontal and temporal lobes. Bilateral temporo occipital white matter show patchy T2 hyper intensity suggestive of associated dysmyelination, bilateral hippocampal Mal orientation, ex vacuo dilatation of temporal horns of lateral ventricles. 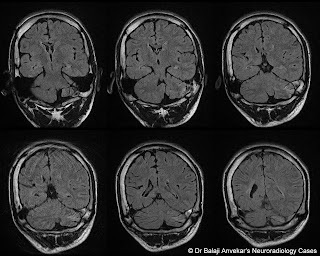 Associated hypoplasia of corpus callosum. 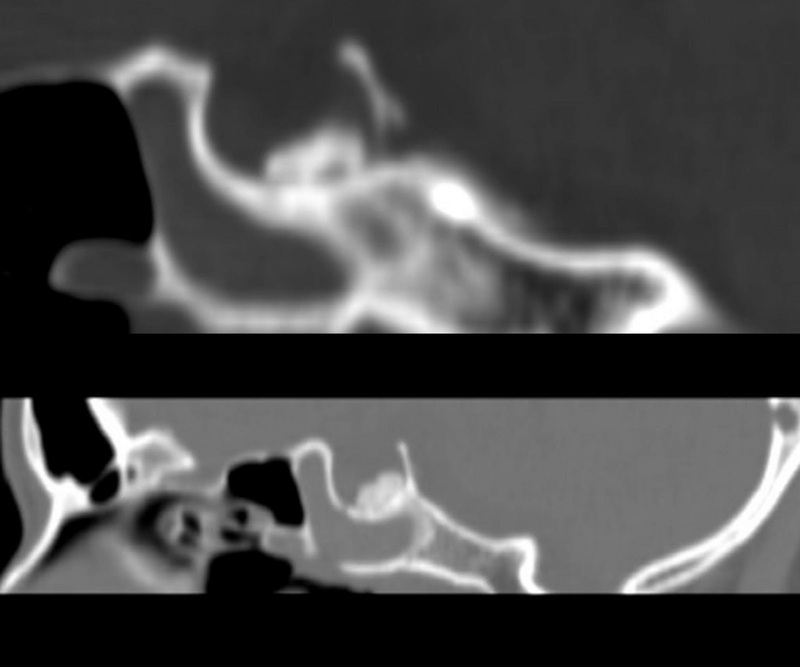 Poorly pneumatised of paranasal sinuses and mastoid air cells. Micro crania, brachycephaly, small posterior fossa. Brainstem atrophy, mid line cleft on ventral aspect of Pons. 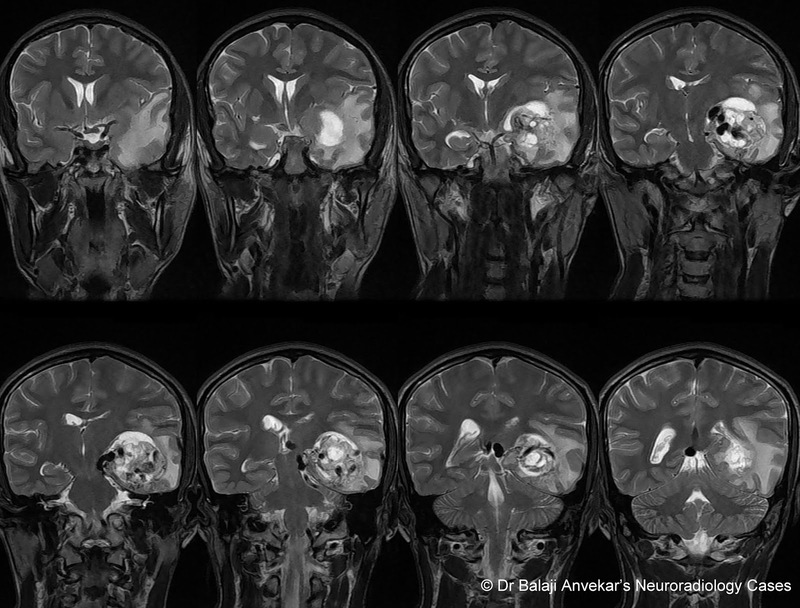 No associated cerebellar dysplasia. Ill-defined mid line vermis. 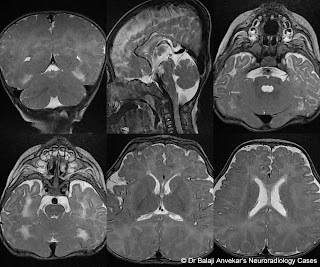 Imaging diagnosis: Fukuyama congenital muscular dystrophy more likely than Walker Warburg syndrome as there is no associated cerebellar dysplasia. Named after Yukio Fukuyama (1928-2014), a Japanese pediatric neurologist, who first described the condition in his 1960. Exclusively found in Japan with an incidence of 2/4 per 100,000 infants and is the second most common muscular dystrophy after Duchenne muscular dystrophy. Affected infants are hypotonic, generalised symmetric weakness affecting extremities and facial muscles by 1 year. Accompanied by developmental delay and intellectual disability afterwards with epilepsy. An autosomal recessive inherited disease due to a mutation in the fukutin-related protein (FKTN) gene. 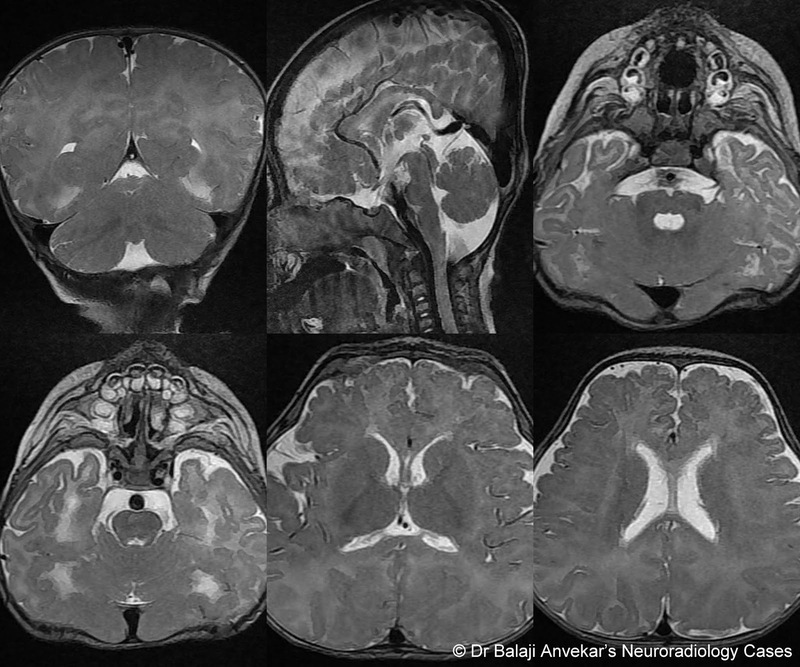 Classic MRI brain features are polymicrogyria typically in the frontal and parietal lobes.Pachygyria in approximately half of patients, typically involving the temporal and occipital lobes. 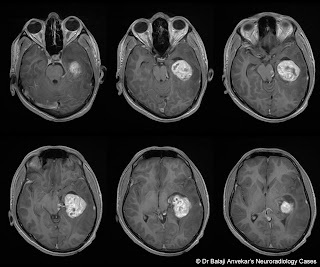 Cerebellar polymicrogyria is seen in approximately 90% of patients. 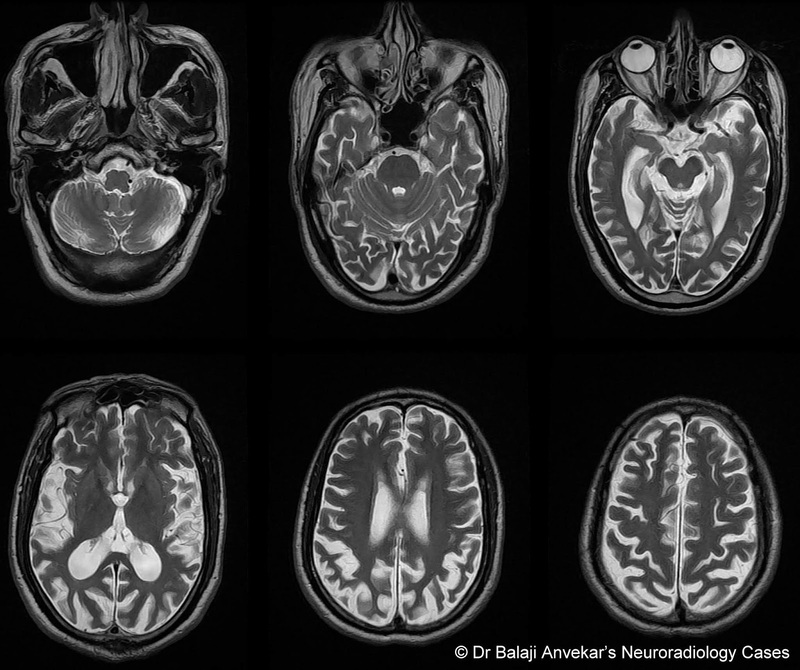 White matter changes patchy, spotty suggestive of dysmyelination. 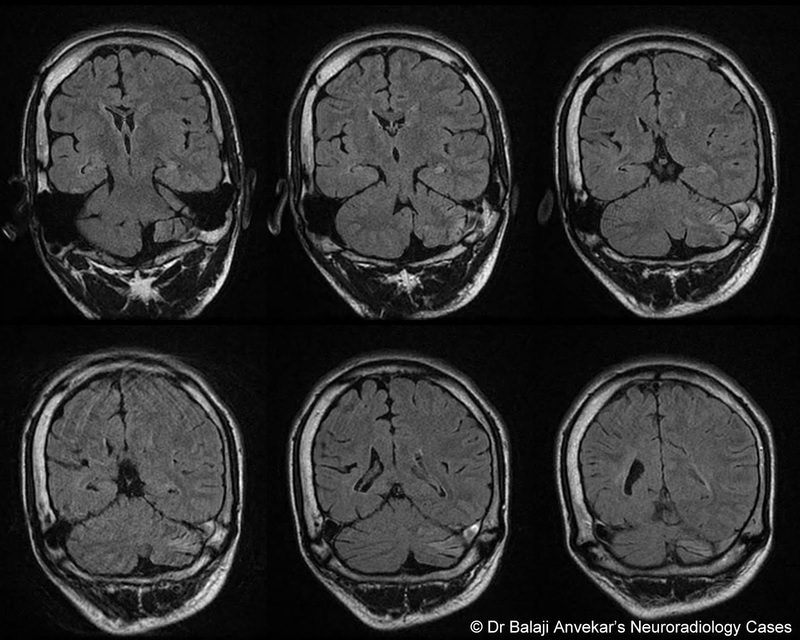 Clinical presentation: Frequent seizures, altered sensorium. 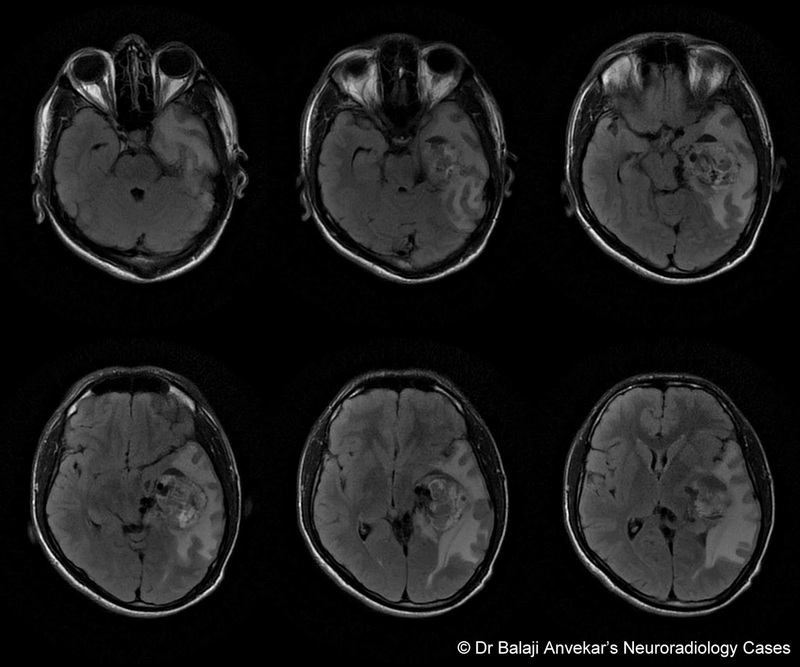 MRI brain shows marked left hemi Atrophy, ex vacuo dilatation of left lateral ventricle owing to volume loss. Left cerebral hemisphere show multifocal patchy areas of cortical T2 hyper intensities without diffusion restriction. 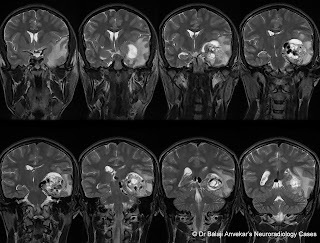 Associated Atrophy of left deep grey nuclei, changes of distal Wallerian degeneration involving left cerebral peduncle of mid brain, Pons. 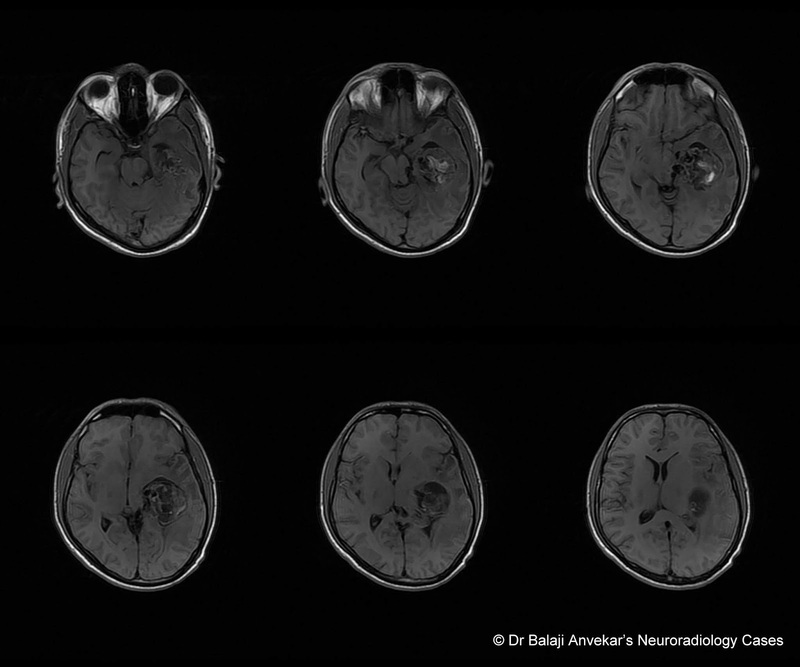 Imaging diagnosis: Sequel of encephalitis / rasmussen encephalitis. Right cerebellar hemisphere show marked atrophy can attributed to associated contralateral cerebellar diaschisis. 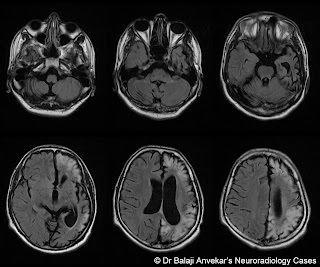 Refers to supra tentorial lesion leading to depressed function, metabolism and perfusion of contra lateral cerebellar hemisphere which is connected via white matter tracts. Interruption of this cortico-ponto-cerebellar white matter tracts which then results in deafferentation and hypometabolism of the contralateral cerebellar hemisphere. 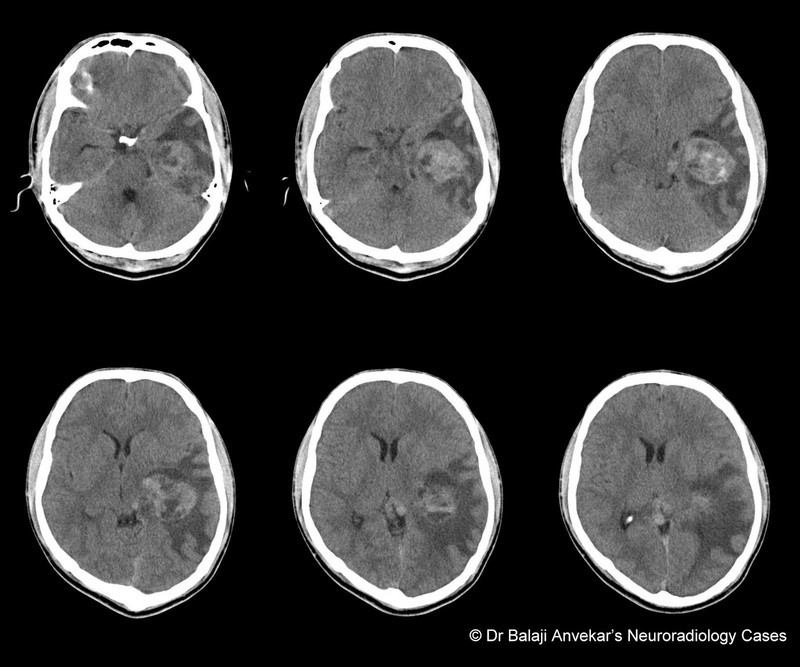 Classically seen following cerebral infarction, although it can be a sequel of any significant supratentorial lesion like bleed, encephalitis as in our case. The same phenomenon can also occur in thalamus called ipsilateral thalamic diaschisis, occurring after an ipsilateral middle cerebral artery territory infarction. 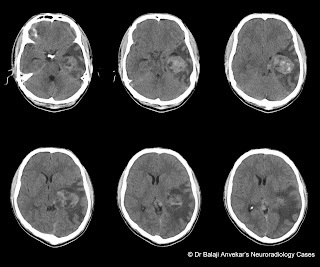 CT or MRI perfusion performed during an acute stroke may show a contralateral cerebellar hypo perfusion. In chronic stages volume loss involving contralateral cerebellar hemisphere. Clinically other than the neurological deficits associated with the contra lateral supra tentorial lesion, the condition is generally asymptomatic. No treatment apart from management of the supratentorial insult. Clinically : Middle aged male with Left side severe neck and shoulder pain followed by left shoulder abduction weakness. Neurological examination mentions rotator cuff abductor weakness and latissimus dorsi wasting. NCV findings positive, confirmed left side supra scapular neuropathy. 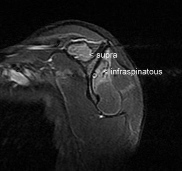 MRI shows diffuse T2 hyper intense odema involving supra and infra spinatous muscle. Deltoid muscle spared. No obvious para labral cyst or supra glenoid notch cyst to cause supra scapular nerve compression. Clinically spontaneous sudden onset without history of trauma or weight lifting. 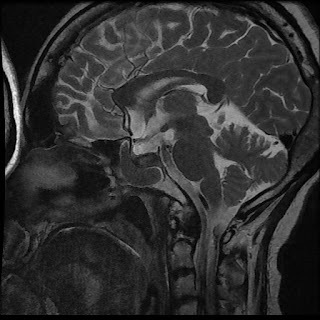 Clinical history and imaging findings are typical of Parsonage Turner Syndrome. 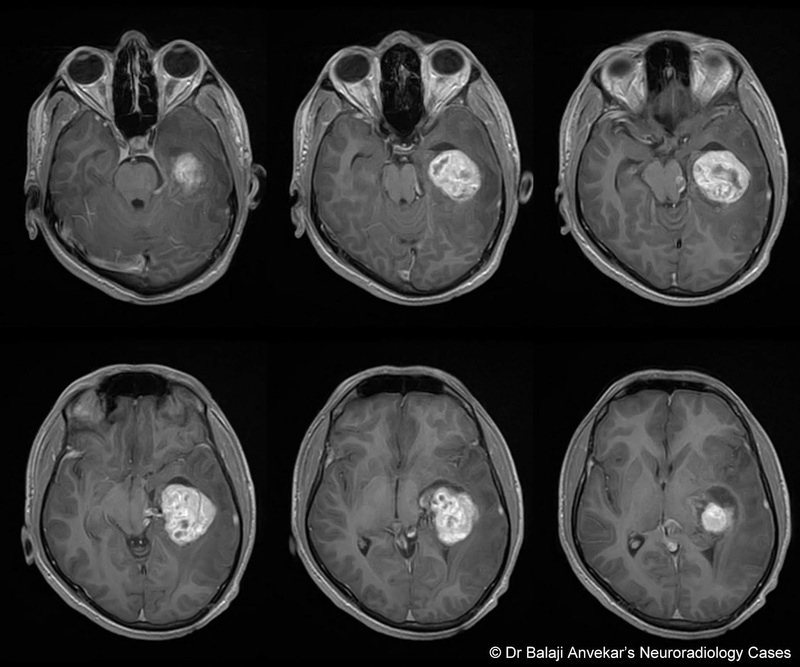 An acute idiopathic brachial neuritis. Male predominance,majority between 3rd to 7th decade. Clinical presentation is typically quite sudden painful shoulder girdle followed by progressive weakness. Symptoms non-specific and can mimic numerous other much more common conditions. Condition is unilateral in two-thirds of cases. A combination of history, EMG with suprascapular neuropathy and imaging findings makes the diagnosis. The etiology is uncertain, although viral infection or immunological cause is suspected. In almost all cases (97%) the suprascapular nerve is involved and muscles are supraspinatus and infraspinatus (innervated by suprascapular nerve. 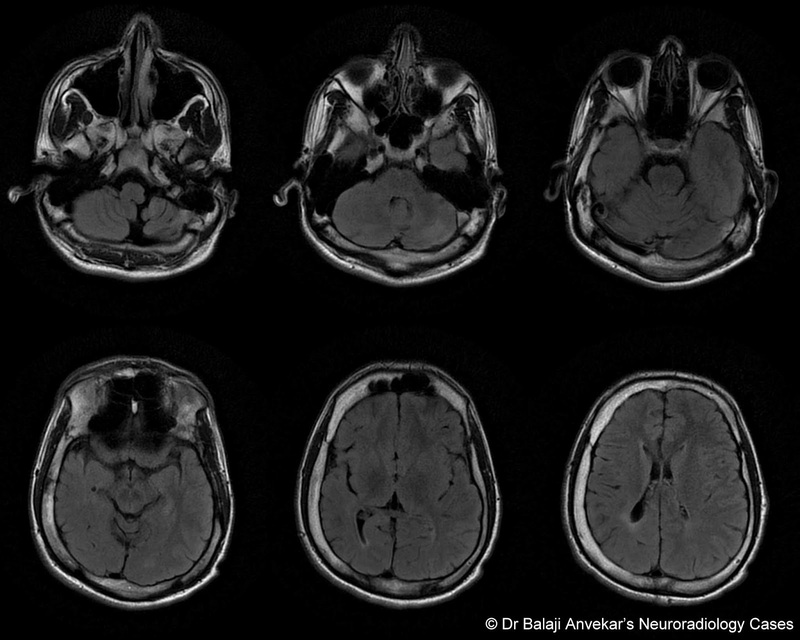 The most striking features on MRI are denervation changes in muscles with diffuse high T2 signal. 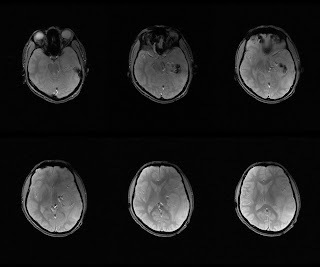 Gradually atrophy and fatty infiltration on follow up imaging or chronic cases. Typically self-limiting and requires supportive therapy. 90% will have excellent recovery by three years. Clinically a known case of pituitary macro adenoma, prolactinoma as lab reports were showing high levels of prolactin. Under regular treatment of Bromocriptine. Also known as pituitary lithiases or pituitary calculus. A very rare entities defined as extensive calcifcation in the sella turcica. There is inconsistency regarding what pituitary stones actually are. 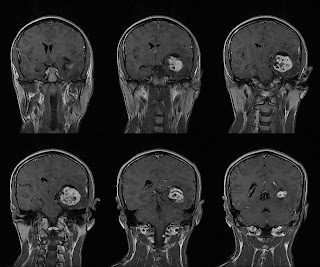 Some authors suggest the term be used only for calcifications in the sella turcica that occur in the absence of any other pituitary pathology, others use this term more liberally to describe excessive calcification from any cause, such as pituitary adenoma. Although the exact incidence is unknown, this entity is generally considered to be very rare as there are only 1 to 6 case reports of idiopathic calcifications so far. However, calcification in pituitary adenoma is considered more common which is approximately 10%. The aetiology of 'primary' de-novo pituitary stones remains an enigma but is thought to be secondary to an unknown inflammatory process, subclinical haemorrhage, or cartilaginous metaplasia. 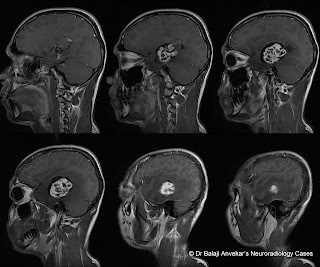 In cases secondary to other pathologies, most commonly pituitary adenomas, especially in prolactinomas, is thought to be a sequelae of fibrosis secondary to haemorrhage. Other secondary causes rare and include Pituitary tuberculosis, metabolic imbalances like hypercalcaemia, sequel of pituitary apoplexy. Clinical presentation varies significantly, may be entirely asymptomatic or endocrinopathies such as hypopituitarism, hyperprolactinaemia from an underlying pituitary adenoma or hemorrahge. CT is the modality of choice, best demonstrated on sagittal reformatted images as in this case, where they appear as well defined hyperdense nodule in the sella turcica. On MRI, signal changes are consistent with calcification that is low signal on T1, T2 as well as GRE without enhancement on post contrast. Presence of stone in a macro adenoma not going to change line of management, treatment should be directed towards underlying cause. It should be left alone if idiopathic and asymptomatic. 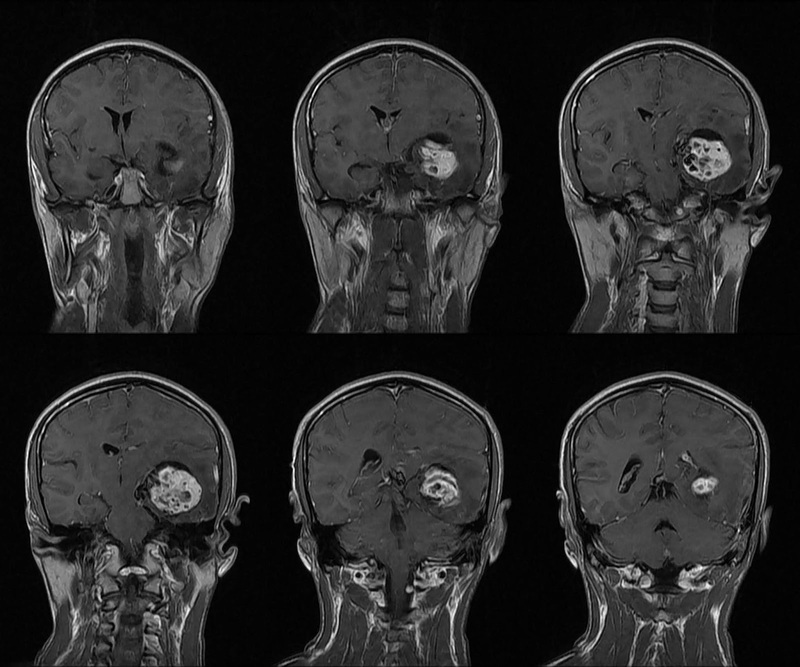 Differential diagnosis off course in absence of macroadenoma should include calcified Rathke cleft cyst, calcified meningioma and calcified aneurysm in pituitary region. Clinically young female with psychiatric complaints like altered behaviors and generalized weakness. 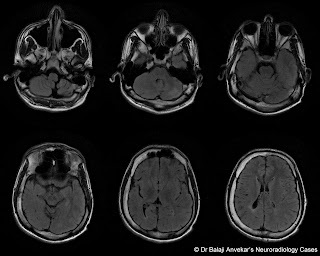 MRI FLAIR images of brain shows bilateral fronto parietal and temporal peri ventricular confluent T2 hyper intensities. 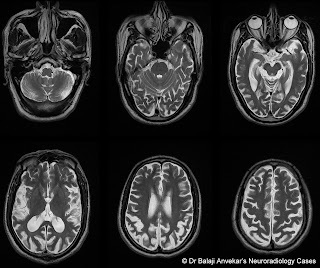 DDs given were Viral encephalitis like HIV encephalitis, ADEM, Toxic Metabolic encephalopathy. 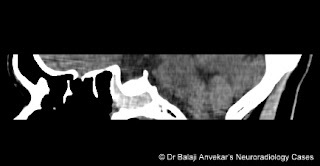 MRI screening of spine shows no obvious spinal cord involvement. Lab report showed significantly low level of Vit B12 suggestive of isolated brain involvement in B12 deficiency. Patient improved with Vit B12 supplements. Vitamin B12 or Cobalamin deficiency causes a wide range of hematological, gastrointestinal, psychiatric and neurological disorders. Neuropsychiatric symptoms may precede hematologic signs and are represented by myelopathy, neuropathy, dementia and visual loss due to optic nerve atrophy. A strict vegetarian diet contains very little cobalamin. There is clear evidence of abnormal cobalamin metabolism in vegetarians and hyper-homocysteinemia is a risk factor, especially for stroke and vascular dementia, vegetarians are advised to take cobalamin supplements lifelong. In developed countries, the diet is rich in meat and cobalamin-rich foods; thus, malabsorption is the most common cause of cobalamin deficiency. Infants born to vegetarian mothers are at risk of cobalamin deficiency and may present with megaloblastic anemia. Clinical and Hematological Manifestations ranges from incidental increased mean corpuscular volume and neutrophils hypersegmentation in otherwise asymptomatic patients to symptoms due to severe anemia, such as angor, dyspnea on exertion, fatigue or symptoms related to congestive heart failure, such as ankle edema, orthopnea and nocturia. Vitamin B12 deficiency may affect both the central (brain, spinal cord and optic nerve) and the peripheral (peripheral nerves) nervous system. The spinal cord involvement is associated with the most frequent manifestation of vitamin B12 deficiency, namely subacute combined degeneration (SCD), is characterized by symmetric dysesthesia, disturbance of position sense and spastic paraparesis or tetraparesis. The most consistent MRI finding is a symmetrical abnormally increased T2 signal intensity, commonly confined to posterior columns in cervico dorsal spinal cord ' inverted V' configuration. Isolated brain involvement has also been reported in B12 deficiency but is rare in adults. 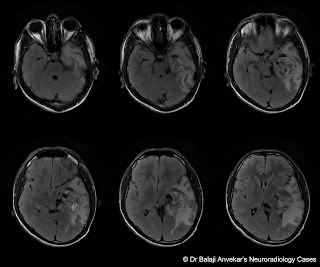 MRI shows confluent T2 high-intensity signal in periventricular white matter. 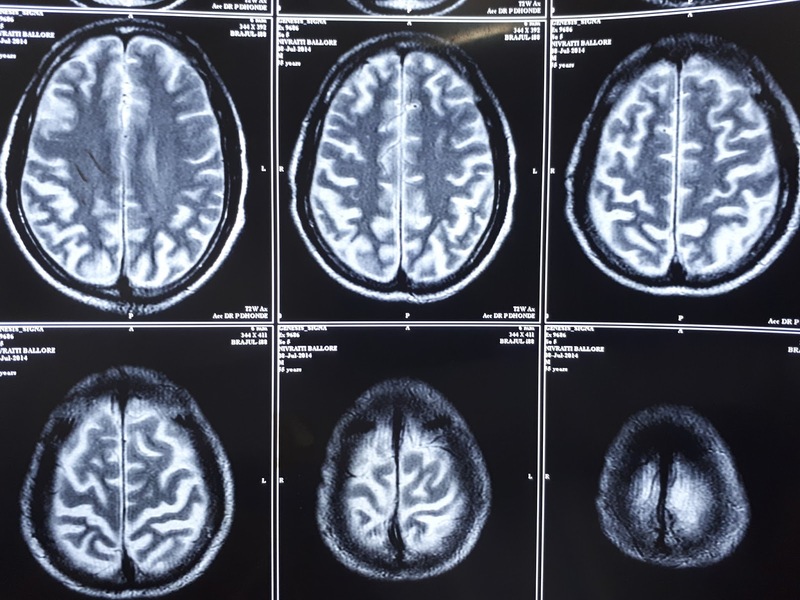 Isolated brain involvement is common in children with inherited cobalamin-related diseases characterized by white matter loss with delayed myelination. 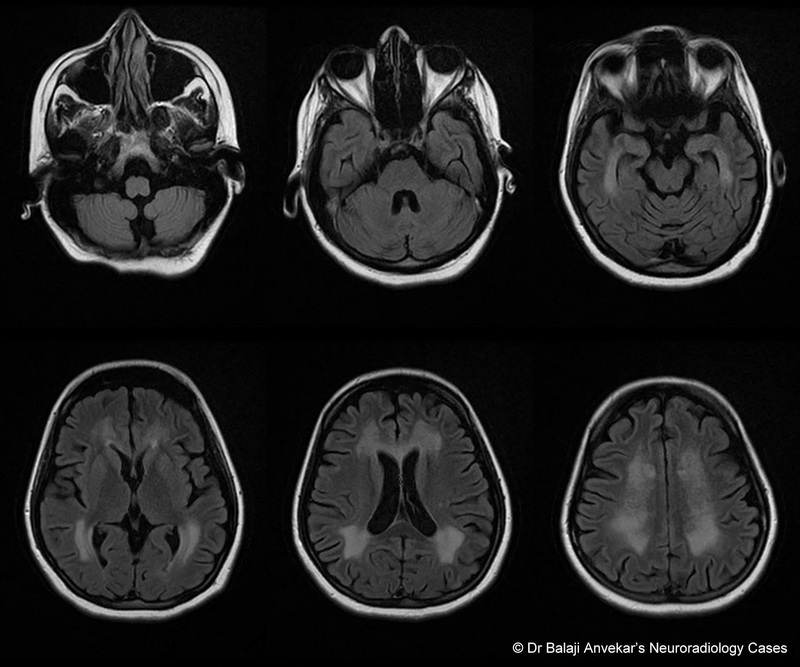 In infants with nutritional cobalamin deficiency MRI has revealed delayed myelination. Therapy is definitely Vitamin B12 supplements oral or intra muscular. 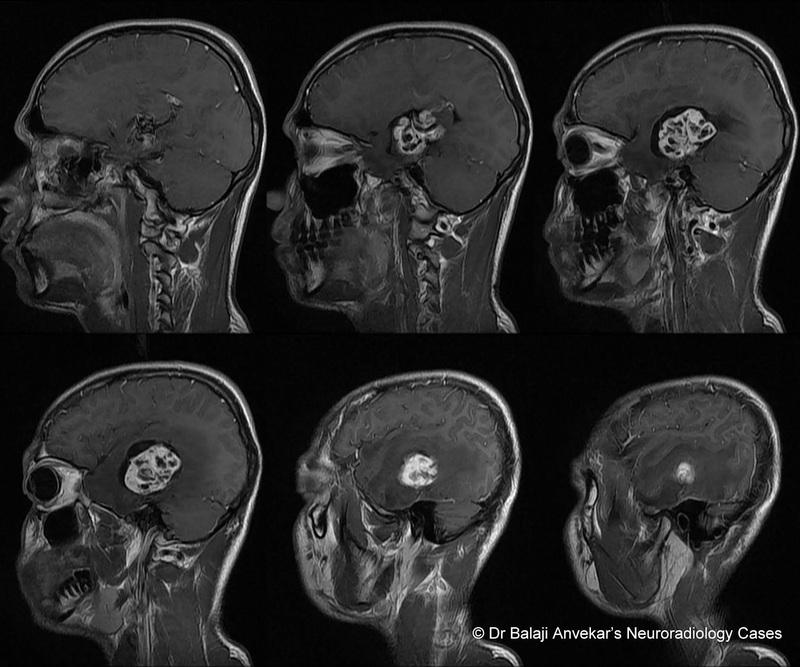 An intra axial posterior fossa mass with cyst and an enhancing mural nodule is a diagnostic clue. 90% posterior fossa (m/c) in that 80% cerebellar hemispheres, 15% Vermis, 5% in other places fourth ventricle, medulla. In ~ 60% of cases mass present as cyst + mural nodule and in ~ 40% of cases only as a solid nodule. 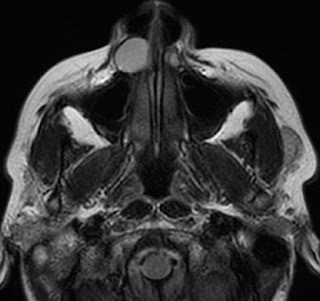 Cyst is clear, density on CT and signal intensity on MRI same as that of Csf, non enhancing thin imperceptible wall. Mural nodule on CT may be iso to hyper dense, intense and homogenous enhancement. On MRI hypo to iso intense on T1, hyperintense on T2 and FLAIR. May see flow voids within the nodule with adjacent vascular feeders on T2w images, intense and homogenous enhancement on T1 images implies to its highly vascular nature. May show low signal intensity hemosiderin staining on GRE if associated to with any bleed. Presentation is usually with headache, dysequilibrium, dizziness may be due to its mass effect and hydrocephalus. Age : for sporadic: 40-60 yr and for familial : can occur at younger age. Slight male predominance. Closest DD is Pilocytic Astrocytoma; mural nodule show mild to moderate enhancement not this intense, not characterized by flow voids and feeders. Seen in relatively younger age group. 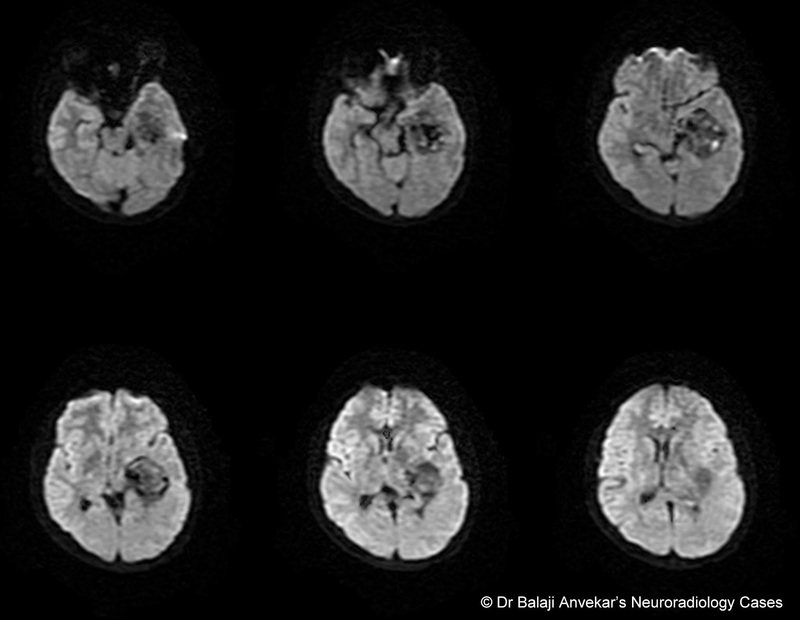 Clinically : progressive dementia, not responding to Csf drainage. 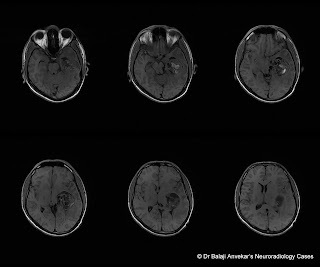 Here is MRI BRAIN compared to previous MRI. Salient feature of this MRI is bilateral posterior cortical atrophy. 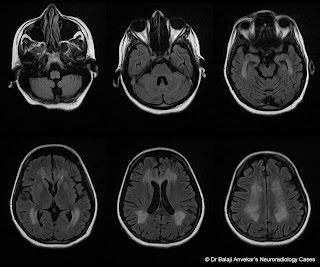 There is moderate grade Atrophy involving bilateral parietal lobes, appears to be progressive as it has increased compared to previous MRI dated 8 July 2014. 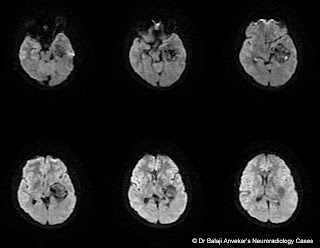 An associated marked mid brain atrophy. 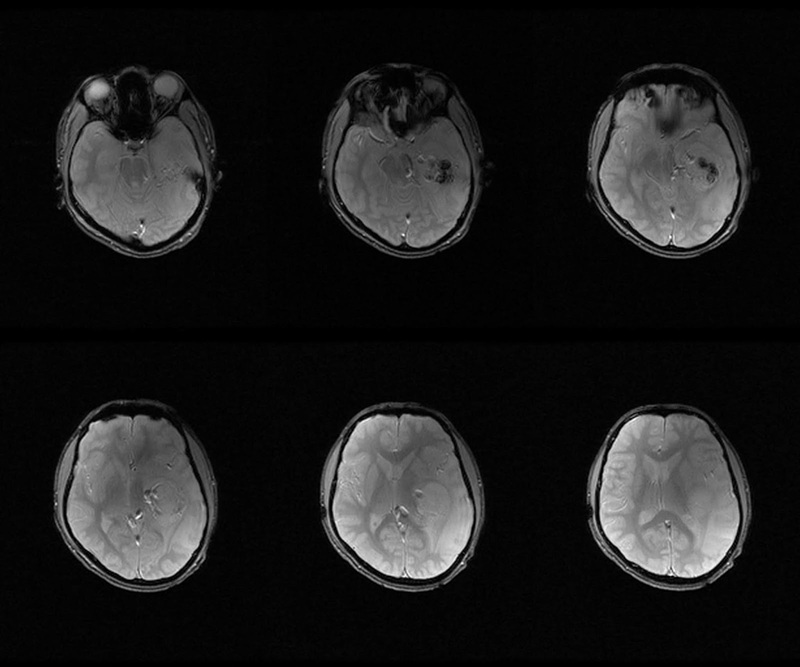 No obvious signal abnormality on diffusion weighted images. Benson's syndrome, an atypical variant of Alzheimer's disease. Refers to a depression in function, metabolism and perfusion affecting the cerebellar hemisphere as a result of contralateral supratentorial lesion. This disturbance occures in a portion of the brain at a distance from the original site of injury but connected via white matter tracts. Initially this phenomenon was defined as being caused by an acute lesion but now considered being related to a lesion of any temporal duration. Other than neurological deficits and clinical features associated with the contralateral supratentorial lesion, this condition is generally asymptomatic. 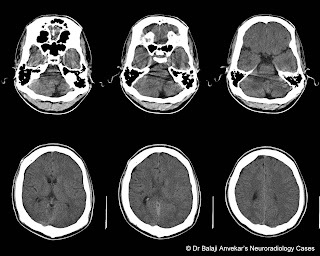 This is a well-recognised phenomenon following cerebral infarction, although it can be a sequela of any significant supratentorial lesion like tumours, intracerebral haemorrhage, encephalitis , Dyke-Davidoff-Masson syndrome, Radiation necrosis etc. There is no treatment for this phenomenon other than management of the supratentorial insult and prevention of further insults.